There are any number of project management courses, methodologies and books published, but this one is different. 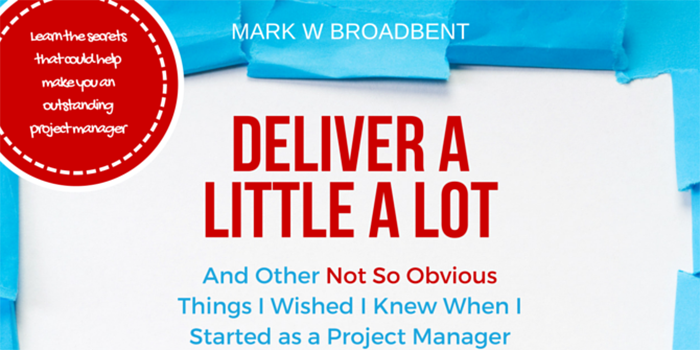 Whether you are a new project manager, or one with more experience, there are plenty of practical tips in this book that will at least provide you with food for thought. Let me be clear about what this book isn’t – it’s not a methodology, and it doesn’t set out a list of project management processes. 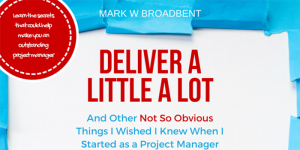 Instead – and what is truly refreshing – is that Mark W Broadbent speaks from experience, about the application of any number of project management methods to the reality of managing projects. From the first chapter, you can tell you are reading pearls of wisdom drawn from years of experience, and getting insights into how you can apply them to your project. If you want to know about work breakdown structures, or risk registers, for example, you can choose any project methodology or software package and build them. Mark W Broadbent does not prescribe a particular methodology that you should apply. Instead, he talks about the pitfalls that have trapped many a project manager in the development of a project plan, or maintenance of risk and issue registers. How do you know whether your project plan is a good one? What risks should you report to your steering committee? This book gives you practical tips on what to look out for. The other refreshing thing about this book is that right from the outset, we read about the people side of projects. The first chapter starts with some of the not so obvious personal traits that are useful for a good project manager. Then throughout the book, he concentrates on another often-overlooked role of the project manager – that of managing a team of people, and celebrating the diverse personal traits that those people can bring to building great teams and delivering successful projects. There are some biases in the book too – you can tell that the author is a devotee of Agile methods. But these are given as examples of approaches you could use, and he explains why he has found them useful. There is an extensive list of resources and links at the end of the book too – covering everything from Agile, to change management, and dealing with difficult people. If you have managed projects in the past, you’ll find yourself reading and thinking, “Oh I fell into that trap too, wish I’d read this earlier”. If you are a new project manager or just completed a training course, the book will help you to apply your chosen methodology to your project. Either way, it’s a compelling read, written in a way that is easy to digest. Make time for it, and you will be rewarded.